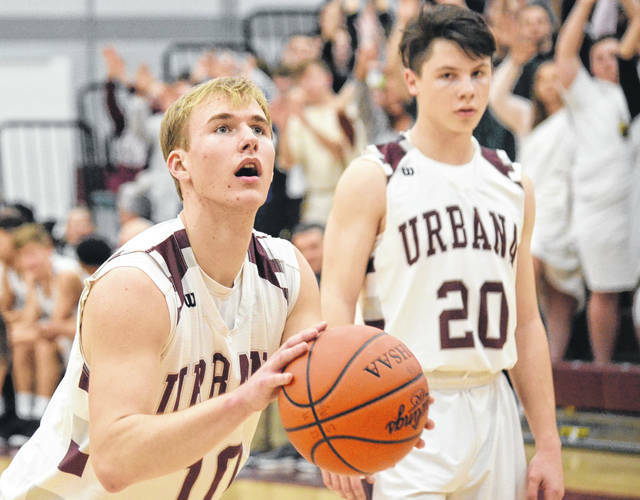 Urbana’s Reid Taylor (10) prepares to shoot a free throw as teammate Gavin Spence (20) and the Urbana student section look on Friday against Northwestern. Urbana used a pair of spurts to beat visiting Northwestern, 51-38, in CBC/MRD boys basketball on Friday. It was Jeremy Dixon’s 200th win as a head coach. “It means I’m getting old and I’ve had a lot of really, really good players and great people come through Urbana. And I’m just thankful the school’s let me hang around this long. It’s been a lot of fun,” Dixon said. After a competitive first quarter, Urbana (9-8, 4-4) went on a tear in the second quarter, outscoring the Warriors, 13-4, en route to a 28-17 halftime advantage. Northwestern (8-10, 3-6) suffered from a few self-inflicted wounds during the run, but a majority of the pain came from an Urbana defense that was reinvigorated by a Grant Hower dunk and kept getting stingier with each made basket thereafter. Isaiah Fonseca had 17 points and Hower had 15 to lead the way for Urbana. Reid Taylor played his usual solid game and Marion Krebehenne was a spark plug off the bench. “I thought Marion Krebehenne came in and had a really nice effect on the game. That’s what he’s done all year for us, is give us some energy. It was a good team win. Isaiah and Grant had a nice night scoring for us and the defense, executing the defensive game plan was much better,” Dixon said. In the second half, the Warriors got as close as seven points. But a strong fourth-quarter surge pushed the Urbana lead back to double digits and, eventually, its widest margin of the game at 15 points. “It was just a solid team win, with great defense,” Dixon said. In the jayvee game, Northwestern prevailed, 42-34. Nasir Cochran and Izaiah Underwood each scored 13 points for Urbana. In the freshman game, Urbana won, 44-21. Zachary Hoskins had 21 points in that game for the Hillclimbers. Urbana goes on the road today to face Olentangy Orange. https://www.urbanacitizen.com/wp-content/uploads/sites/36/2019/02/web1_ReidTaylor020819_ne201928203214436.jpgUrbana’s Reid Taylor (10) prepares to shoot a free throw as teammate Gavin Spence (20) and the Urbana student section look on Friday against Northwestern.